Background: Tamulotoxin (TmTx) from Buthus tamulus was found to be a highly venomous toxin which accelerates the neurotransmitter release that directly affects the cardiovascular tissues and the respiratory system leading to death. TmTx from red Indian scorpion is a crucial inhibitor for Ca 2+ activated K + channel in humans. Objective: The study is aimed at the identification of potential inhibitors of TmTx through pharmacophore based inhibitor screening and understanding the molecular level interactions. Materials and Method: The potential inhibitors for TmTx were identified using pharmacophore model based descriptor information present in existing drugs with the analysis of pharmacokinetic properties. The compounds with good ADMET (Absorption, Distribution, Metabolism, Excretion and Toxicity) descriptors were subjected to molecular interaction studies. The stability of bound toxin-inhibitor complex was studied using molecular dynamics simulation over a period of one nanosecond. Results: From a dataset of 3406 compounds, few compounds were selected as potential inhibitors based on the generated best pharmacophore models, pharmacokinetic analysis, molecular docking and molecular dynamics studies. Conclusion: In conclusion, two compounds containing better inhibition properties against TmTx are suggested to be better lead molecules for drug development in future and this study will help us to explore more inhibitors from natural origin against tamulotoxin. Most of the functions involved in the cellular mechanisms of many human proteins are still unrevealed. Among these proteins, the roles played by ion channel proteins are more crucial as they are responsible for several neurological diseases with severe side effects and high mortality rate. Many researchers have been focusing their work on Ca 2+ activated K + ion channels and their functions because of the blocker toxins, which play a key role in ion channels. ,, The origination of neurotoxin from animals become one of the main threats as several short-chain neurotoxins produce a high-level of blockage action in ion channel proteins, which leads to adverse reaction in the host cells. , Tamulotoxin (TmTx) from Buthus tamulus was found to be a highly venomous toxin. It accelerates the neurotransmitter release, which directly affects cardiovascular tissues and respiratory system to lead to death. , This toxin had been classified under short chain toxin having a low molecular mass of 4213 Da. The highly stabilized toxin structure possesses three intra-molecular disulphide (S-S) bonds, which always gives a strong and stable conformation. Several molecular interaction studies and inhibitor designing studies for biological toxins have been carried out using computational biology tools. The earlier computational biology studies on toxins by our group with analog based virtual screening and docking strategies had found new potential inhibitors against various toxins. , It is worthy to mention that analyzing the toxins with their receptors at molecular level had provided reasonable results and relatively novel findings. In this study, the three-dimensional (3D) structure of TmTx predicted using comparative modeling techniques and stabilized using molecular dynamics (MD) simulation was prepared for further in silico analysis. We employed pharmacophore model based compound selection for identification of potential compounds from the compound library. The best pharmacophore model was selected based on the best-fit value obtained from HipHop program in Accelrys Discovery Studio (ADS) and was used to search against the drug like database, Minimaybridge. Molecular interaction studies and MD simulation studies have also been performed. From these studies, we have obtained a series of compounds showing wide range of properties in different levels of screening, and two compounds with good interactions proposed to be the alternative lead molecules for tamulus scorpion sting. Strengthening reliable information is the fastest way in drug discovery process. Existing therapeutic agents for scorpion stings were searched and potent antidotes were fetched out from various sources such as literatures, chemical databases, and so on. Prazosin, dobutamine, digoxin, and digitoxin were found to be the best antidotes for red scorpion bites. In order to get reliable pharmacophore models, we have chosen structurally similar drugs of these three compounds. Training set was constructed by considering each compound with high structural similarity and similar pharmacological properties. 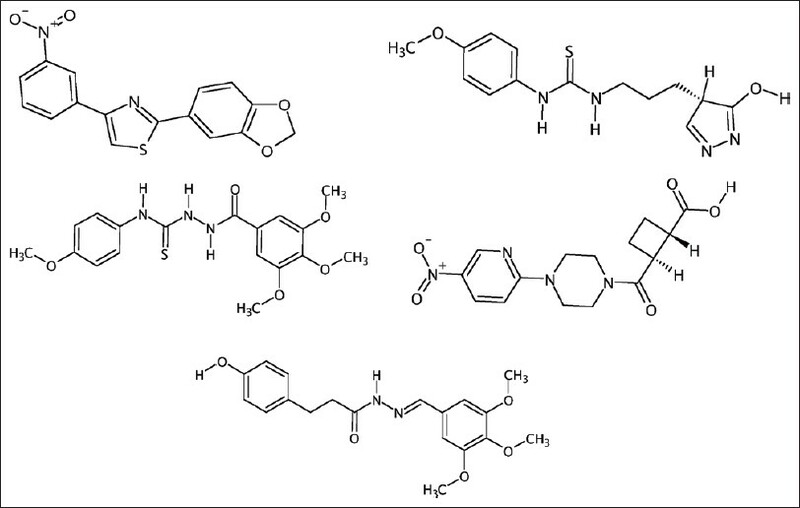 These compounds were further analyzed for generating common features, which will help in the selection of a suitable inhibitor. The key features that are responsible for biological function were generated using pharmacophore model generation. The potential ligands with therapeutic background were used for constructing common feature based pharmacophore model. Initially, molecular interaction studies were performed to identify the activities of all compounds. The parameters like principal value, maximum omit feature value and minimum inter feature distances were set to 2.0 and 2.97 Å respectively, and the common feature pharmacophore generation protocol was executed with diverse set conformations, generated using diverse conformation generation protocol. With the result of common feature pharmacophore model generation, desired chemical groups were identified using feature mapping protocol. Best featured model were selected using common feature pharmacophore generation protocol in ADS because this protocol uses HipHop module of catalyst program to derive the best featured model with vital descriptors like hydrogen bond donor (HBD), hydrogen bond acceptor (HBA), hydrophobic (HY), ring aromatic (RA), positive ionizing (PI), and negative ionizing (NI). , From the generated 10 pharmacophore models, we have selected the best one based on the descriptor set and rank, which is further used to search against MiniMaybridge database in ADS. The obtained compounds were further screened based on the fit value (fit value ≥ 2) and this selection parameter, yielded compounds with the specified features for supplementary study. The datasets obtained from MiniMaybridge database are subjected to ADMET screening in ADS 2.0 to derive the drug likeliness. We have analyzed six pharmacokinetic properties, including absorption, solubility, blood brain barrier (BBB), hepatotoxicity, plasma protein binding (PPB) and cytochrome P450 (CYP) D6 enzyme inhibition study. Results based on the above mentioned parameters were analyzed according to the limitation of software. The compounds, which show efficiency in the level of drug likeliness were further allowed to molecular interaction studies. Compounds with good pharmacokinetic properties were opted for molecular interaction studies. TmTx, the target protein was prepared by adding hydrogen atoms with chemistry at Harvard molecular mechanics (CHARMm) force field. In order to get the stable conformation of target protein, 2000 steps of iterations were performed with Smart minimizer protocol in ADS for energy minimization. Binding site of the protein molecules were identified using Q-site finder and validated using ADS-binding site analysis tool. In silico interaction studies were carried out using LigandFit program in ADS. LigandFit is a docking program and it will do three important tasks while docking the ligand into the active site of the target protein. First, it will dock a set of compounds into the binding site of protein molecule. Then it minimizes the ligand energy when binding to the receptor protein. Finally, it scores the interaction and filters the best scored poses of the ligand. It also provides reliable results among the existing docking programs. Best poses of each ligand was examined with the calculation of Root mean square deviation (RMSD) threshold diversity (1.5 Å). We have used different scoring functions including piecewise linear potentials (PLP1 and PLP2), potential mean force (PMF), Jain Score, Dock Score and ligand internal energy. Compounds showing better scores were taken for further analysis. In addition to this, we have also analyzed properties like H-bonding and non-bonded interactions. Molecular dynamics (MD) simulation studies were carried out to know the strength of the interaction between the toxin and inhibitors and the stability of the complex. For this study, we have used the Standard Dynamics Cascade program present in ADS. This program was executed with 1000 steps of Steepest Descent algorithm followed by 2000 steps of conjugate gradient algorithm. In heating process we have used 1000 steps with the time duration of 0.001 ps and initial temperature was set to 50 K with the target temperature of 300 K. In equilibration, iterations were set to 1000 and the remaining parameters were kept default. The final production step with 1,000,000 cycles of thermodynamics ensemble had been performed with constant volume ensemble (NVT) to control temperature throughout the simulation process. Compounds with good antitoxic effects were explored via various resources, from that prazosin, dobutamine, digoxin, and digitoxin were found to be the best drugs which are being used for scorpion bites. , From this information we have generated 3D database for these four compounds. Initially we have performed interaction and pharmacokinetic studies for these four compounds with TmTx. Initially we made a small database of these four compounds and it was used as input for pharmacophore generation. Common feature pharmacophore generation protocol had been used for this study. These selected inhibitors shows diverse set of pharmacophore features. In order to retrieve the best model, most of the analyzed parameters were HBD, HBA, HY, PI, and NI. As a result, 10 pharmacophore models were generated using HipHop program and the best pharmacophore was analyzed and the consolidated results are given in [Table 1] and [Table 2]. 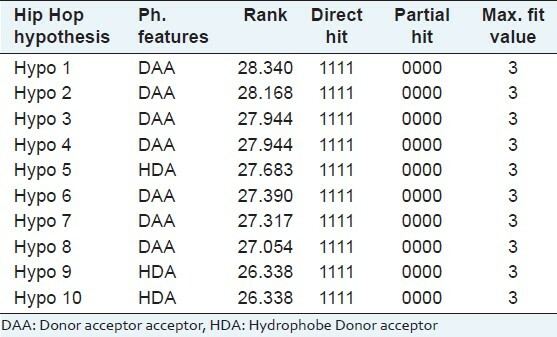 From these results, seven Donor acceptor acceptor (DAA) and three hydrophobe Donor acceptor (HDA) descriptors were present in the derived pharmacophore models with scores ranged from 28.340 to 26.338. Hence, best pharmacophore models were selected based on the best fit value and used for further studies. These best models were found to have the most common features with more or less same interfeature distances with different orientation of vectors HBD and HBA. Hypo 1 shows the best features for further studies. The best derived pharmacophore model with the compounds is given in [Figure 1]. Pharmacophore featured compounds retrieved from MiniMaybridge database using search 3D Database protocol. We have obtained 3406 hits after running the program with fit values ranging from 0.5 to 2.8. Then the selected compounds were filtered based on the fit value ≥2. As a result of filteration, we have obtained a few hundred compounds. In order to analyze the rest of the compounds with less pharmacophore features, we have reduced the fit value to 1. Then the best compounds with all specified properties are selected by removing less featured compounds (fit value ≤1). The filtered compounds were further examined by their pharmacokinetic and toxicity background using ADMET descriptors analysis protocol in DS. Different levels of parameters were used for this study including BBBs, solubility, bioavailability, hepatotoxicity, etc. to analyze all 3406 compounds. According to the Discovery Studio parameters, standard analysis value like level 0 for human intestinal absorption, level 3 and level 4 for solubility, level 0 for non-inhibitory property with CYP450 2D6, level 3 for BBB penetration and level 0 for non-toxicity were filtered for obtaining drug like compounds. Finally, 217 compounds were obtained and used for further molecular interaction studies. Molecular interaction studies were performed for selected compounds with drug likeliness properties using LigandFit protocol of ADS. The target protein (TmTx) with minimized energy and simulated orientation was obtained by applying CHARMm force field. Binding site of the TmTx was predicted using Q-site finder and validated with binding site prediction tool in ADS. As a result of this, we have found only one binding site present in this toxin protein with the volume of 132.750 Å 3 with amino acids Asp1, Leu2, Arg4, Cys17, Thr21 and Arg23. Database compounds with good pharmacokinetic background were docked into the binding site of TmTx using space complementarity docking present in Ligand Fit tool of ADS. Five scoring functions have been used to achieve best inhibitors. Ten best poses were retrieved for each ligand with dock score. Other scoring functions were also considered for selection of best compounds. In total 88 compounds have shown better results and dock score >17.5 were taken for analyzing their inhibitory properties. Among the 88 compounds only 12 compounds satisfy all levels of scoring functions then these compounds are screened for H-bonding interaction. At this level, only five compounds were exhibited their interaction with active site residues of toxin protein. The best five compounds were taken based on their pharmacokinetic profile and these potential ligands interact well with the binding site residues are depicted in [Figure 2] and the details of interactions are given in [Table 3]. The MiniMaybridge database contains five compounds namely HTS03335, CD02928, ML00365, HTS00263, and BTB01034. The detailed chemical structures of the selected compounds are depicted in [Figure 3]. ML00365 and BTB01034 have reliable dock scores and good interactions with binding site residues among five potential inhibitors. ML00365 has H-bonding, interactions with Asp1 and Thr21. BTB01034 has H-bonding interaction with Leu2. Asp1 with H41 of ML 00365 has formed strong bonding, which modulates the activity of toxin. Another important bonding between Thr21 and ML00365 possesses both acidic/basic and oxidative features. The detailed dock scores with various scoring functions are given in the [Table 4]. The stabilization of the docked complex was studied using MD simulation studies. For this study, we have used ADS-Standard Dynamics Cascade program for analyzing the inhibitor bound complex molecules with CHARMm force field. Analysis of the dynamics trajectories revealed that the inhibitor bound toxin complex was well stabilized. It is to note that in addition to the interactions with the binding site residues, there exists a water molecule which provides a strong frame work for the stability through water mediated interactions, which may also implicate in toxin specificity. The detailed studies of dynamics and obtained final energies were given in [Figure 4]. Even though there are many drugs available for scorpion stings, the activity and safety of those drugs are always a concern. Common feature pharmacophore models were developed and the best pharmacophore model was used to search the reliable pharmacophore feature for selecting compounds from MiniMaybridge database. The final screening of compounds was carried out based on the pharmacokinetic and interaction studies with the validation of molecular dynamics simulation. As a result of different levels of analysis we have selected five compounds namely HTS03335, CD02928, ML00365, HTS00263 and BTB01034. These five compounds are further sorted based on the LigandFit scoring functions. Among these compounds, ML00365 and BTB 01034 showed better results in all levels of this study. The MD simulation studies were carried out mainly to explore the strength of interaction between the toxin and a ligand. Further in vitro studies are needed to confirm the activity of the selected inhibitors to identify the functionality of these compounds as alternative drugs for tamulus toxin. 1. Cecilia V, Ramon L, Neil VM, John PA. Calcium-activated potassium channels. Curr Opin Neurobiol 1998;8:321-9. 2. Brenner R, Jegla TJ, Wickenden A, Liu Y, Aldrich RW. Cloning and functional characterization of novel large conductance calcium-activated potassium channel beta subunits, hKCNMB3 and hKCNMB4. J Biol Chem 2000;275:6453-61. 3. Garcia ML, Galvez A, Garcia-Calvo M, King VF, Vazquez J, Kaczorowski GJ. Use of toxins to study potassium channels. J Bioenerg Biomembr 1991;23:615-46. 4. Martin-Eauclaire MF, Couraud F. Scorpion neurotoxins: effects and mechanisms. In: Chang LW, Dyer RS, editors. Handbook of Neurotoxicology. New York: Marcel Dekker Inc.; 1995. 683-716. 5. Tytgat J, Chandy KG, Garcia ML, Gutman GA, Martin-Eauclaire MF, van der Walt JJ, et al. A unified nomenclature for short-chain peptides isolated from scorpion venoms: Alpha-KTx molecular subfamilies. Trends Pharmacol Sci 1999;20:444-7. 6. Escoubas P, Romi-Lebrun R, Lebrun B, Herrmann R, Moskowitz H, Rajendra W, et al. Tamulotoxin, a novel member of potassium channel active short toxins from the venom of the Indian red scorpion Buthus tamulus. Toxicon 1997;35:806. 7. Galvez A, Gimenez-Gallego G, Reuben JP, Roy-Contancin L, Feigenbaum P, Kaczorowski GJ, et al. Purification and characterization of a unique, potent, peptidyl probe for the high conductance calcium-activated potassium channel from venom of the scorpion Buthus tamulus. J Biol Chem 1990;265:11083-90. 8. Bawaskar HS, Bawaskar PH. Utility of scorpion antivenin vs. prazosin in the management of severe Mesobuthus tamulus (Indian red scorpion) envenoming at rural setting. J Assoc Physicians India 2007;55:14-21. 9. Peker E, Oktar S, Dogan M, Kaya E, Duru M. Prazosin treatment in the management of scorpion envenomation. Hum Exp Toxicol 2010;29:231-3. 10. Bawaskar HS. Efficacy and safety of scorpion antivenom plus prazosin compared with prazosin alone for venomous scorpion (Mesobuthus tamulus) sting: Randomised open label clinical trial. BMJ 2011;342:c7136. 11. Bawaskar HS, Bawaskar PH. Stings by red scorpions (Buthotus tamulus) in Maharashtra State, India: A clinical study. Trans R Soc Trop Med Hyg 1989;83:858-60. 12. Elatrous S, Nouira S, Besbes-Ouanes L, Boussarsar M, Boukef R, Marghli S, et al. Dobutamine in severe scorpion envenomation: Effects on standard hemodynamics, right ventricular performance, and tissue oxygenation. Chest 1999; 116:748-53. 13. Gupta BD, Parakh M, Purohit A. Management of scorpion sting: Prazosin or dobutamine. J Trop Pediatr 2010;56:115-8. 14. Wang W, Shen SR, Feng FQ, He GQ, Wang ZL. Pharmacophore-based structure optimization of angiotensin converting enzyme inhibitory peptide. Sci China B 2008;51:786-93. 15. Yu K, Fu W, Liu H, Luo X, Chen KX, Ding J, et al. Computational simulations of interactions of scorpion toxins with the voltage-gated potassium ion channel. Biophys J 2004;86:3542-55. 16. Kumar RB, Suresh MX. A computational perspective of molecular interactions through virtual screening, pharmacokinetic and dynamic prediction on ribosome toxin A chain and inhibitors of Ricinus communis. Pharmacognosy Res 2012;4:2-10. 17. Kumar RB, Suresh MX. Computational virtual screening and inhibitory analysis of N-phenyl hydroxy pyrrolidine analogs against ribosome inactivating protein, Ricin from Ricinus communis. J Pharmacy Res 2011;4:4546-52. 18. Kumar RB, Suresh MX. Comparative modeling, toxin-ion channel interactions, quantum based molecular dynamics and simulation studies on potassium channel toxin alpha-KTx 1.11 blockers, slotoxin from centruroides noxius. Int J Biom Bioinformatics 2012;4:18-22. 19. Adane L, Bharatam PV, Sharma V. A common feature-based 3D-pharmacophore model generation and virtual screening: Identification of potential PfDHFR inhibitors. J Enzyme Inhib Med Chem 2010;25:635-45. 20. Thangapandian S, John S, Sakkiah S, Lee KW. Ligand and structure based pharmacophore modeling to facilitate novel histone deacetylase 8 inhibitor design. Eur J Med Chem 2010;45:4409-17. 21. Zuccotto F. Pharmacophore features distributions in different classes of compounds. J Chem Inf Comput Sci 2003;43:1542-52. 22. Ekins S, Chang C, Mani S, Krasowski MD, Reschly EJ, Iyer M, et al. Human pregnane X receptor antagonists and agonists define molecular requirements for different binding sites. Mol Pharmacol 2007;72:592-603. 23. Yu-Chian CC. Chemoinformatics and pharmacoinformatics approach for exploring the GABA-A agonist from Chinese herb suanzaoren. J Taiwan Inst Chem Eng 2009;40:36-47. 24. Brooks BR, Bruccoleri RE, Olafson BD, States DJ, Swaminathan S,Karplus M. CHARMM: A program for macromolecular energy, minimization, and dynamics calculations. J Comp Chem 1983;4:187-217. 25. Laurie AT, Jackson RM. Q-SiteFinder: An energy-based method for the prediction of protein-ligand binding sites. Bioinformatics 2005;21:1908-16. 26. Venkatachalam CM, Jiang X, Oldfield T, Waldman M. LigandFit: A novel method for the shape-directed rapid docking of ligands to protein active sites. J Mol Graph Model 2003;21:289-307. 27. Gleeson MP, Deechongkit S, Ruchirawat S. Molecular dynamics investigation of psalmopeotoxin I. Probing the relationship between 3D structure, anti-malarial activity and thermal stability. J Mol Model 2011;17:769-75. 28. Thangapandian S, John S, Sakkiah S, Lee KW. Molecular docking and pharmacophore filtering in the discovery of dual-inhibitors for human leukotriene A4 hydrolase and leukotriene C4 synthase. J Chem Inf Model 2011;51:33-44. 29. John S, Thangapandian S, Sakkiah S, Lee KW. 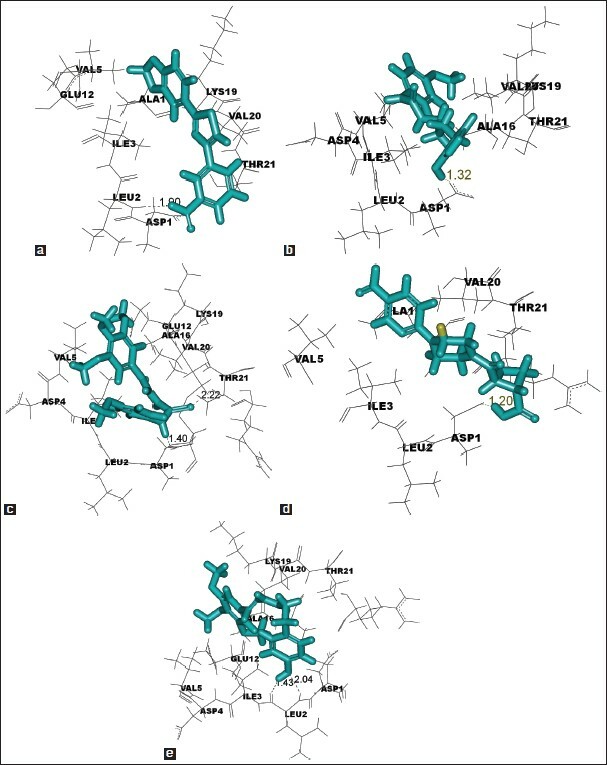 Identification of potent virtual leads to design novel indoleamine 2,3-dioxygenase inhibitors: Pharmacophore modeling and molecular docking studies. Eur J Med Chem 2010;45:4004-12.